A check box can have two possible values: True or False. You either do want a biscuit, or you don't! Click on the CheckBox tool to add it to a form. 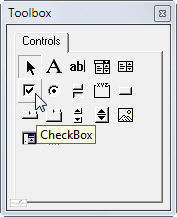 The Alignment property doesn't align the text within its container, but instead specified whether it should appear to the right or left of the tick box. The text appears to the right of the tick box, but is left aligned. 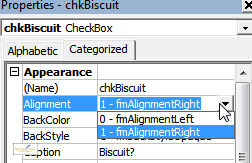 If you set a checkbox's Tristate property to True (not the default) it can - as the name suggests - have 3 possible values, according to whether it is ticked, unticked or left null (in which case it would appear shaded). I can't help feeling you'd be better off with a combobox instead, however!